Excellent post. This is a very common problem that should be addressed by a medical professional not handled entirely by the dancer herself. No telling what permanent damage might result. I had this problem throughout my teenage years until I started modern dance. Turnout just does not seem to be a natural position for my body. I still experience the popping from time to time even at the age of 21. I now have a lot of back problems though I don’t know if the issues are related. I agree with your suggestion to seek a professional medical opinion. Physical therapy has also helped me along the years. The third -can- be correct by instruction. 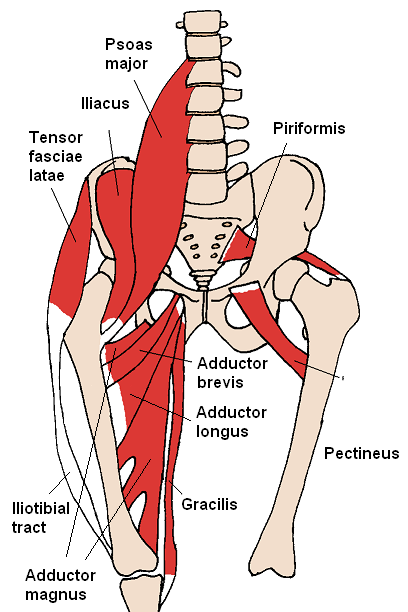 Sitting in the hips, acetabular compression is caused by a weakness in the IT Band. Sitting happens when a dancer does not learn to use the IT band to lift out of the hip on the supporting side. The worst offender of this is when the teacher applies the now antique(Old Cecchetti and English schools) instruction of positioning the leg `a la seconde aligned with passive turnout, (meaning aligned with the flat edge of the femoral head, combined with the focae of the acetabulum from frontal to lateral directions) So, one the dancers over rotates the leg so that the sole of the foot is seen forward. There are two problems with this instruction: one, rotating the leg as such forces the dancer to compress down into the supporting hip. Two, the illiopsoas no longer has the basis of control over the lateral motion of the leg, particularly in pirouettes seconde or fouette’s entournant. This instability is further inpinged by the other core muscle groups as well as the glutteous group that cannot control the leg in any position. Part of the result is the the dancer is forced to place the femoral/pelvic articulartion direction of the the supporting metatarsus, causing a plethora of difficulties throughout the leg, but mostly the hip. The correction is to have the dancer position their working leg aligned with the name of the position “`a la second. 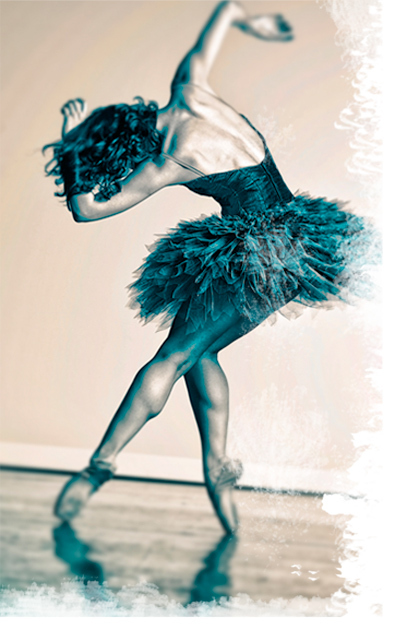 From second position of the feet, the dancer performs a tendu `a la seconde: all that is required is lifting the foot and turnout out as much as possible. iN height, the upper body must accoadate by either pitching laterally as in ecarte’s, or curving the spine laterallyas the leg lifts the pelvis, -but- with the gluts of the supporting side firmly positioning the weight over the supporting arch. The leg is as turned out as it is in any range of motion. The working hip may “open” (move slightly posterior to accommodate the turnout. Meanwhile the supporting side must lift over the supporting arch and the supporting foot must place the fifth metatarsus firm on the ground. It is a matter of conquering weakness. This is relative to the dancer’s body. the dancer’s body is shaped according to proscenium so that there is a uniformity to be witnessed amongst all dancers – particularly corps de ballet. But, to the point, the supporting side informs the working side and visa versa. If the working leg is thought only to externally rotate from the hip, then the dancer has not been taught to use all the muscle groups possible. Same with the supporting side. Popping of the hip is common. rest and proper usage can mitigate it is some dancers. However, certain body types will struggle with it, regardless. And, I agree: a visit to an orthopod or PT may be in order. The photo associated with the blog post shows this problem to a small degree. The girl is pushing down against her It band and rotating her working leg forward of `a la seconde. With a simple nudge she could be corrected. But, worse, here is a URL of a photo of a retired dancer performing `a la seconde incorrectly. Look at the photo. See how she sits pulling back and side in her hips, the compression against her knees and torque in her ankle? The position should have been corrected while she was young.